We had a great turnout for tonight’s first meeting of Anarchist Theory by Anarchist Women. We read outloud from A Thousand Rioters, Selected Writings bofLucy Parsons. We read and discussed her essays, The Principles of Anarchism and Crime and Criminals. For next week’s class we decided to read Lucy Parsons‘ essay To Tramps and Voltairine de Cleyre’s essay Direct Action. Both of these essays are available online, and there are hard copies of Direct Action available at the Wingnut. Feel free to come by during Open Hours on Wednesday or Friday from 4 to 9pm to pick up a copy. The Wingnut is located at 2005 Barton Avenue. Anarchist Theory by Anarchist Women is being held on Tuesday nights at 8:30pm. The Wingnut is a sober, all ages space. Richmond Food Not Bombs is planning a calendar as a fundraiser. We will be taking pictures of Food Not Bombs participants doing silly/cute Food Not Bombs related activities. Come over to the Wingnut on Saturday December 3rd from 2pm to 4pm or during Food Not Bombs on Sunday December 4th. Dave and Kontra will be taking pictures! So if you are a food not bombs participant past or present, come by this weekend and we will see what pictures we can take and then use the best ones in the fundraising calendar! Tomorrow – Really Really Free Market and Letter Writing to Prisoners! November’s Really Really Free Market – an excellent alternative to holiday consumerism- will be happening tomorrow from Noon until 3pm in Monroe Park at the corner of Main and Laurel. The weather looks great- sunny and 65- so come hang out! Bring your excess belongings to give away- books, clothes, movies, food, appliances, music, and more! Come discover the treasures of community events and maybe a knick knack you like. 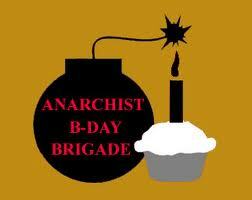 Come join the Anarchist Black Cross at the monthly Really Really Free Market (on the last Saturday of every month) to write letters to prisoners who will be celebrating their birthdays the following month. We will have a table set up with instructions, addresses and descriptions, envelopes, and people to help answer any questions. rvaabc@gmail.com to get in touch! We will be using the prisoners’ birthdays posters created monthly by the Chapel Hill Prison Books Collective, and will also have additional prisoner addresses available. This is a monthly event that will repeat every last saturday of each month. This event occurs from 12-3pm at the corner of Main and Laurel in Monroe Park. Come on out to support political prisoners and talk to people interested in prison abolition. Richmond Copwatch will be out on Saturday, December 3rd to observe and record the police during the late night Shockoe Bottom bar/club scene. We will be meeting at 10:00pm in front of Main Street Station (1500 East Main Street). All are welcome to come out, regardless of experience! Shockoe Bottom is an area known for its bars, clubs, venues, and general night life. There have been numerous reports of police violence and brutality in the crowd control tactics used by the Richmond Police Department.The new “zero tolerance” approach of the City government and Police Department seems to result in more aggressive behavior on the part of the police. The police engage in similar behavior at Shockoe Bottom on the weekends as they have during the First Fridays Art Walk- blockading streets, diverting traffic and harassing the general public. The aggressive, illegal, and unprofessional behavior of the Richmond Police Department as a whole, simply goes to show the necessity of Copwatch, and the regular observing and recording of a police force as long as one exists. Beyond that the continued violent and oppressive behavior of many members of the Richmond Police Department goes to show the systemic nature of problems with police- problems that will be solved not through reform, but through abolition. Since the Richmond Police Department has a significant presence in Shockoe Bottom, Richmond Copwatch will be there. We will go over some brief Know Your Rights information, and discuss the situation we will be observing. We would like to encourage folks who can to come out the day before to a Copwatch Training we will be hosting on Friday December 2nd at 6pm at Festival Park (next to the Richmond Coliseum between 5th and 7th streets). Ideally, everyone going out to Copwatch will have a theoretical training before engaging in these sometimes tense situations. We will be doing patrols of the Shockoe Bottom area with a focus on recording police interactions with people. This is meant to curb the level of violence in the RPD’s crowd control tactics in this area, and to ensure there is a record of evidence when police brutality and violence occurs. Depending on the number of Copwatchers who show up, we will likely split into two or more working groups and begin patrols shortly after 10:00pm. Come out for as much or as little of this Copwatch Patrol as you are able. If you cannot find us, the point of contact for December’s Shockoe Bottom Copwatch patrol will be (804) 300-0023. Fair warning: Copwatchers expose themselves to a certain level of legal risk and police harrassment. If, like us, you refuse to be intimidated by these thuggish oppression tactics, come and join us! You can get in touch with Richmond Copwatch at sbhcopwatch@gmail.com or (804) 303-5449, or come to the Copwatch meeting on December 27th at 7:00pm, at 2005 Barton Avenue. Richmond Copwatch will be out on December 2nd to observe and record the police during December’s First Friday. We will be meeting at 6:00pm at the statue in in Festival Park. All are welcome to come out, regardless of experience! Festival Park is located between Fifth and Seventh Streets, adjacent to the Richmond Coliseum (which is at 601 East Leigh Street, downtown). The park between the former 6th Street Marketplace and the Richmond Coliseum is called Nina F. Abady Festival Park. Festival Park is open until 3am so this will be a safe, public place to meet even after dark. We will present a How to Copwatch training, in order to try to get everyone the information they need to be safe and effective. We will be doing patrols of the First Friday Art Walk with a focus on recording police interactions with people. This is meant to curb the level of violence in the RPD’s crowd control tactics during this event, and to ensure there is a record of evidence when police brutality and violence occurs. Depending on the number of Copwatchers who show up, we will likely split into two or more working groups and begin patrols shortly after 7:00pm. If there is not much of a police presence, we might keep patrols short and encourage folks to attend the Shockoe Bottom Copwatch Patrol the following day (Saturday Dec. 3rd meet at 10pm in front of Main Street Station). Come out for as much or as little of First Friday as you are able. If you cannot find us, the point of contact for December’s First Friday Copwatch patrol will be (804) 300-0023. We keep adding books and zines to our radical lending library. If you are interested in ideas of anarchism, feminism, queerness, radical change, organizing, non-hierarchical organizing, etc. you are likely to find a book or zine of interest to you. We have Open Hours on Wednesdays and Fridays from 4pm to 9pm, where folks are welcome to come over, browse the library, check out a book, read a zine, drink some tea, play games, or have conversations. This project is a direct response to the arrests in made in Richmond, VA November 10th, 2011. Two individuals, one a student, one a local activist, were arrested and charged with a class 6 felony for concealing their identity with handkerchiefs. The video will have a series of portraits all containing people wearing various ‘socially accepted’ masks ie; scarves for the cold, motorcycle helmets, respirators, santa claus beards, etc. These will be shown silently and the video will end with someone wearing a handkerchief and a brief statement about the city charging students and local activists with a class 6 felony for wearing one. The film will show how we all use these ‘dangerous’ masks on an everyday basis and stripping someone of their rights (right to vote, access to jobs, loans, etc and the social stigma associated with a felony conviction) for something so inherently trivial and innocent can not go unquestioned. Tonight we are marching as part of Occupy Charlottesville along the Downtown Mall in Charlottesville in response to the arrests of Eric Scott and Hunter Singleton during a march in Richmond on November 9th, 2011. We march tonight to strengthen the regional movement to occupy public spaces and all spaces and to show that solidarity with those imprisoned is possible, doesn’t matter where we are. We march tonight in recognition of the old saying that “an injury to one is an injury to all” when fighting against systemic oppression and injustice. To Mayor Dwight Jones and Police Chief Bryan Norwood we say that we are watching and we have each others’ backs. To the Charlottesville City Council we also say that we have a regional network of people who support each other and are willing to stand up to keep these occupations going for the long haul. Join community organizations in remembering those lost this year with a candlelight reading of names hosted by Rev. Jeanne Pupke, Rev. Robin Gorsline, and Ted Heck. A reception with light refreshments will follow the memorial. Help spread the word – posters and flyers for the event are available for download at http://gayrva.com/remember. Also consider attending the 7th Annual VCU Drag Ball this Saturday, November 19th at 7:00pm in the Commonwealth Ballroom. Tickets will be sold in Breakpoint for $5 with 100% of proceeds benefiting Fan Free Clinic! Gay RVA posted a letter submitted in solidarity with Eric Scott and Hunter Singleton on their website today. They also included a picture of one of the banners made by Richmond Anarchists at the beginning of the Occupy Richmond occupation of Kanawha Plaza. 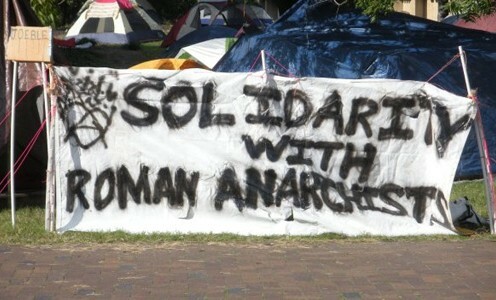 We expressed solidarity with Roman anarchists specifically because they were attacked by “non-violent” protesters for engaging in acts of property destruction during Occupy Rome.